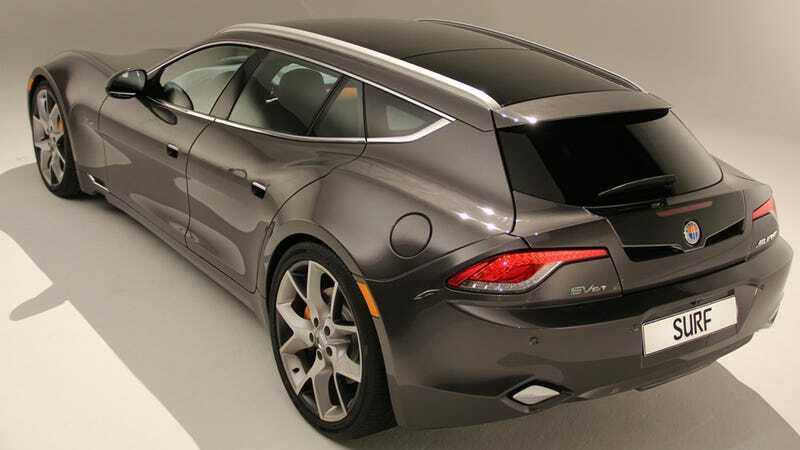 Fisker should probably be concentrating on fighting off the lingering smells of vaporware and cutting weight, but GTspirit reports that the company is going to expand its line up with a station wagon called the Surf. We last saw the Fisker Surf Concept at the glamorous Frankfurt Motor Show, and this September it will apparently be following the path of Kaiser Wilhelm's troops, marching in full production guise to the Paris Auto Salon. The Fisker wagon will not be present in neutral Switzerland for the Geneva Motor Show. Though it looks like it has rear visibility to put a Lamborghini to shame, the Surf should at least address some concerns that Fisker's curvaceous sedan, the Fisker Karma, is lacking in trunk space. Sadly, eco-minded millionaires may have to wait until at least 2013 to see a production version of Fisker's convertible, the Sunset.